Hi everyone! Happy Saturday! 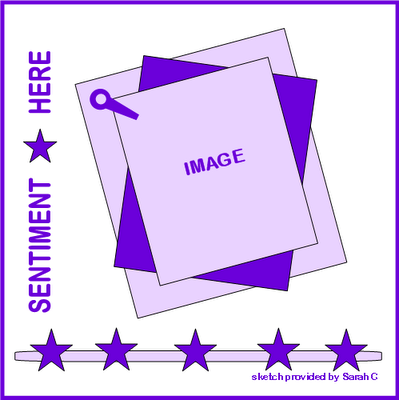 I just want to share with you a card patterned after the ongoing sketch challenge over Crafty Muse. This sketch was provided by my fellow Craft Muse DT Sarah. I coloured Milly Rose using Copic markers and Bic Mark-It. I've just noticed that I'm so into Prismacolor colouring these past few days that's why I decided to use my Copics for a change. :) And besides, my papers and cs are all vibrant and bright so Copics can justify that quality. I've embossed the 2 background cs with my Cuttlebug Divine Swirl embossing folder and die cut the sentiment using my Olivia alphabet set. I used Dimensional Magic to give the letters a bit of effect. I then finished my card by putting some Copic Spica glitter pen here and there. 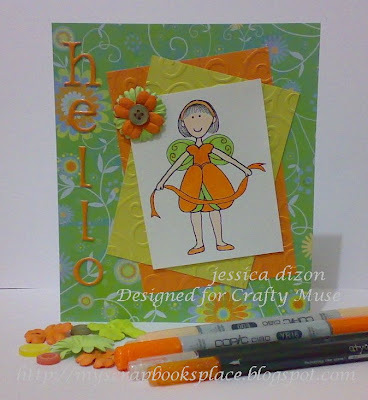 Hope you like my card and if you have time, please visit the Crafty Muse blog and join our sketch challenge. It is so bright and vibrant... love the colours and the diecut sentiment is groovy!! :) I love how the embossing mimics the patterned paper! clever! It looks great with the copics and blooms in the photo too! !